From Penistone Hill Country Park, nr Haworth, Keighley (GR 025364). 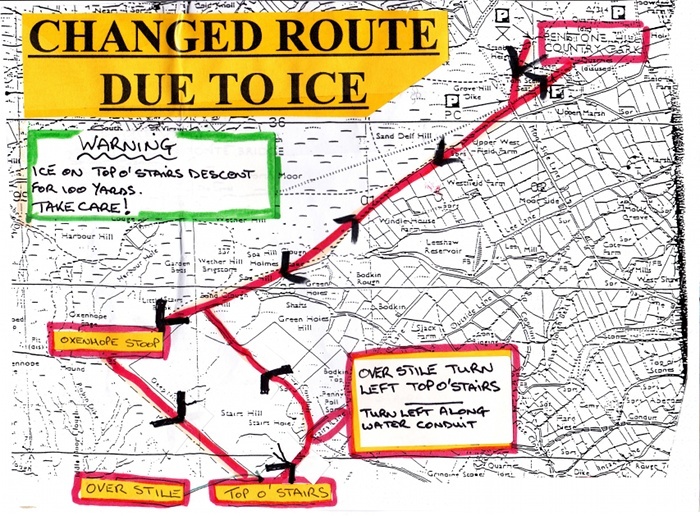 Wednesday's ALS race will be going ahead with a changed route due to ice and snow. Sarah Rowell's ladies course record time of 40:05 set in 1995 will be nigh on impossible for the men's winner to get near given the conditions.....or is it? The men's record is 34:01 by Ian Holmes in 2003, no way, no how!! All other details are the same as before, the cricket hut is set, hot coffee and biscuits are awaiting you all, prizes are in the pub, the roads are clear and we will be gritting the track on to Penistone Hill - please take care though! And you may wish to park nearer the Old Sun pub, not on Penistone. It will be a great day of racing, see you all there.